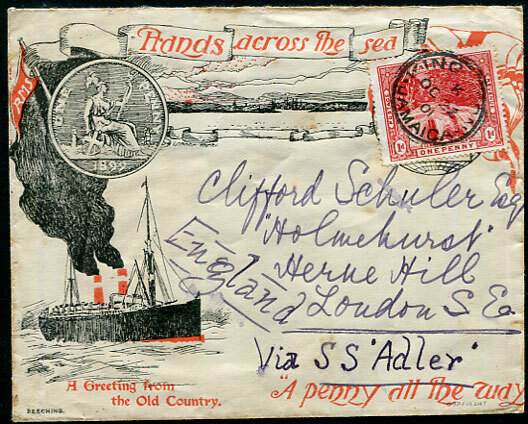 1903 Watkins-Scott Liebers "Trinidad Prices Current" marked "per s/s Maraval" with ½d Britannia (defective) pmk'd Port of Spain K/AP 7 03 to Capt W.H. 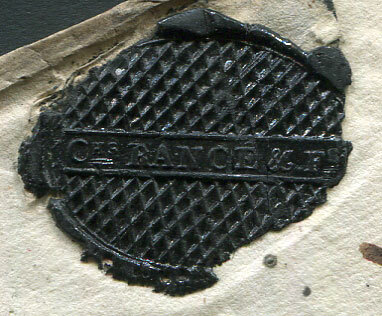 Bernard, Prince Edward Island, reverse fine Summerside AP 22 03 duplex. 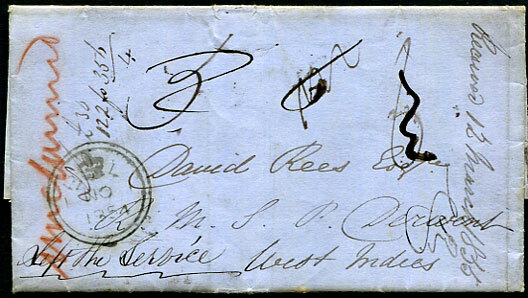 1854 entire written London and pmk'd NO 1 1854 to David Rees, R.M.S.P. 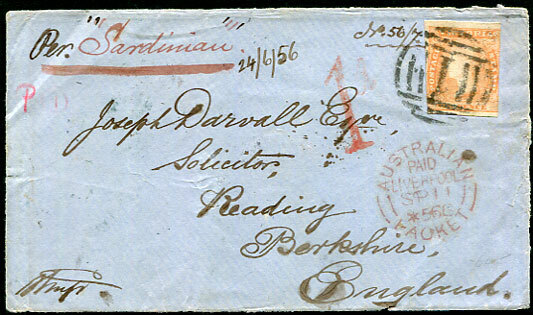 Derwent, Barbados rated both "5" and "6" (each deleted) with BARBADOES NO 21 1854 dbl-arc across reverse flap and additionally marked manuscript "Left the Service" and "unclaimed". 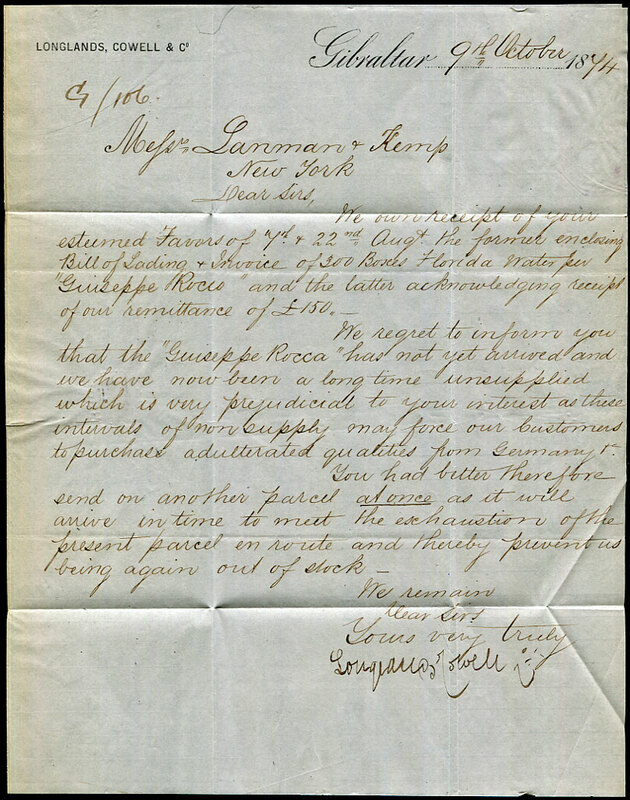 Writer commiserates with Rees' failure to get the expected promotion in the RMSP Company and encloses a £30 draft drawn on the Colonial Bank on account of a legacy. 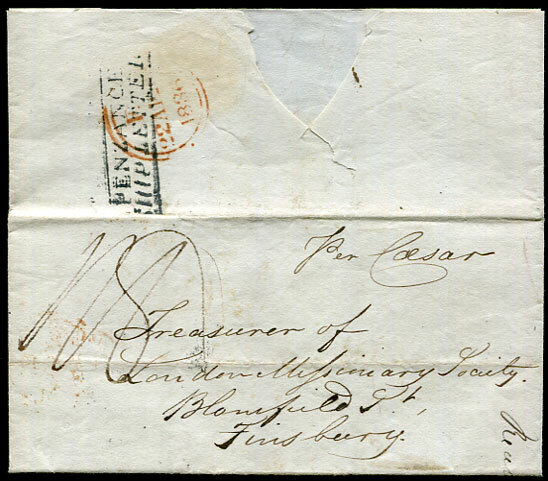 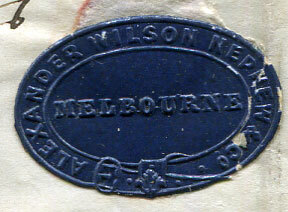 Additionally marked "Received 12 March 1855" so it is assumed that the letter eventually caught up with him. 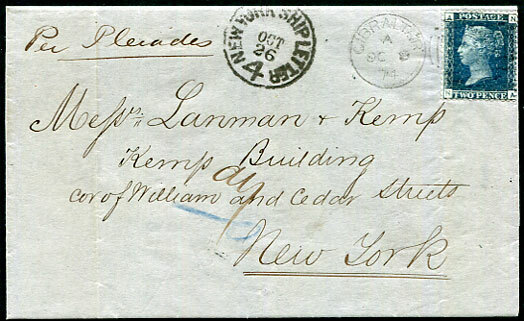 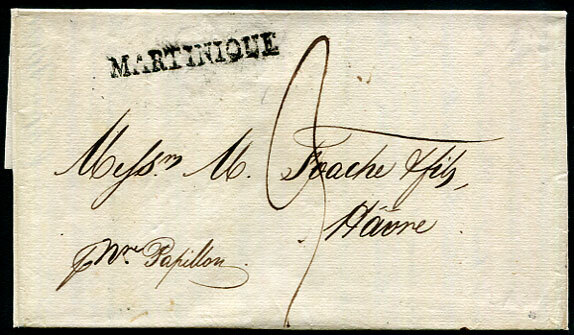 1890 use of QV 1½d lilac Post Card marked Per Steamer "Finance" via New York to Marlebone, London pmk'd open bootheel duplex dated A/AP 10 90 showing NY APR 27 90 transit, filing fold. 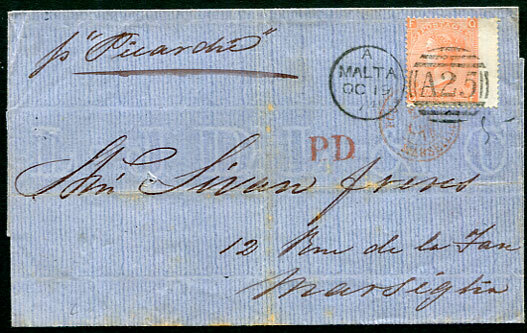 1883 cover "per R.M. 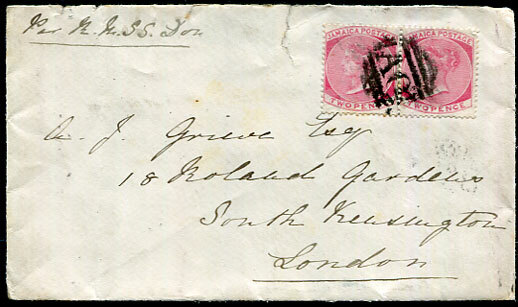 S.S. Don" to London with pair QV 2d pmk'd ""A01", reverse without flap clear of Kingston IV E/DE 24 83 and London G7/JA 12 84 cds, small tear at top. 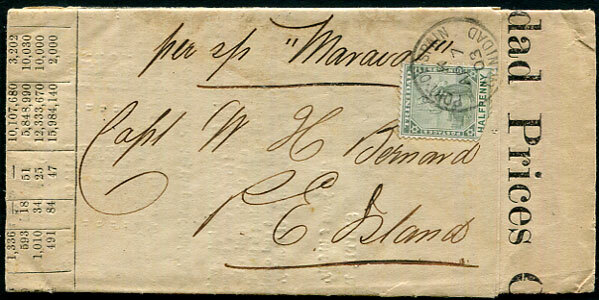 1840 lengthy cross-written entire headed "H.M.S. 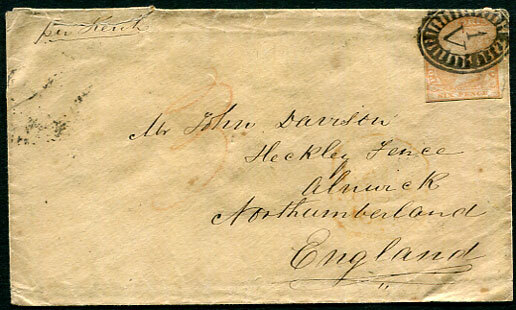 Cleopatra, Barbadoes Dec 10th 1840" from Alex Milne to his father Vice Admiral Sir David Milne. 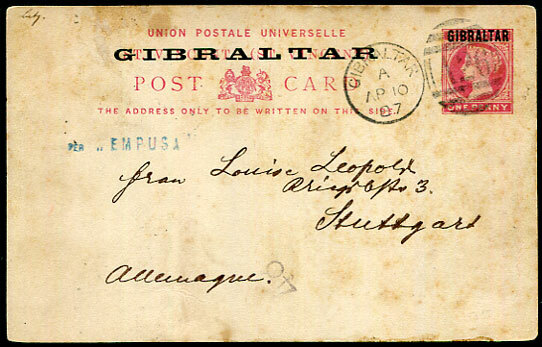 G.C.B. 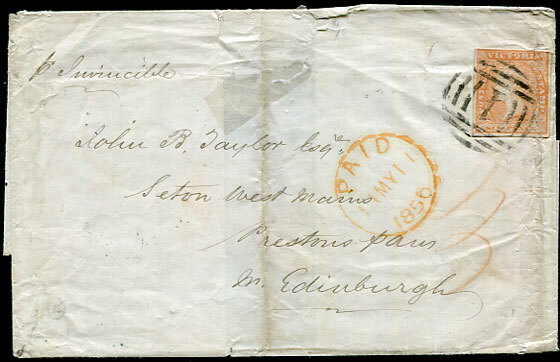 in Musselburgh, Scotland rated 1/- unpaid and carried "loose" by the packet as landed with green LEEWARD ISLAND/F as country of origin not obvious, upper flap with red FEB 16 1841 arrival. 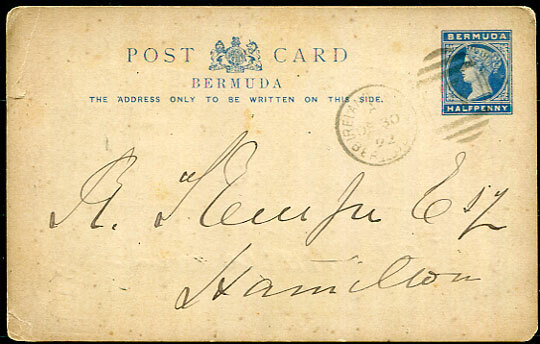 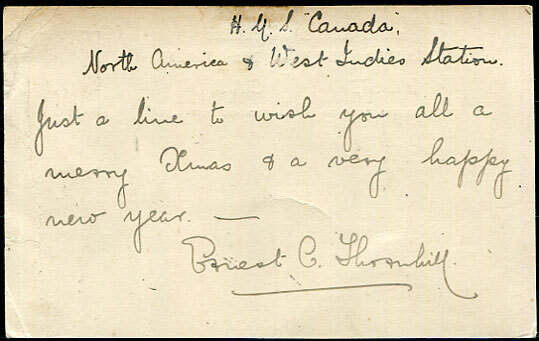 Contents open with "My dear Father, I wrote Lady Milne from Antigua and now write this before sailing tomorrow on cruise for some weeks in the vicinity of Porto Rico and St. Thomas's..."
HMS Cleopatra (2nd of this name) was a 26-gun Vestal-class 6th rate frigate. 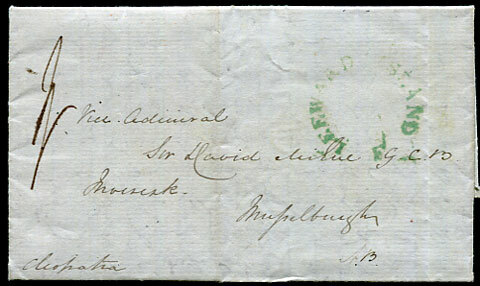 In 1839 command was given to Captain Stephen Lushington to take up duties on the North America & West Indies Station. 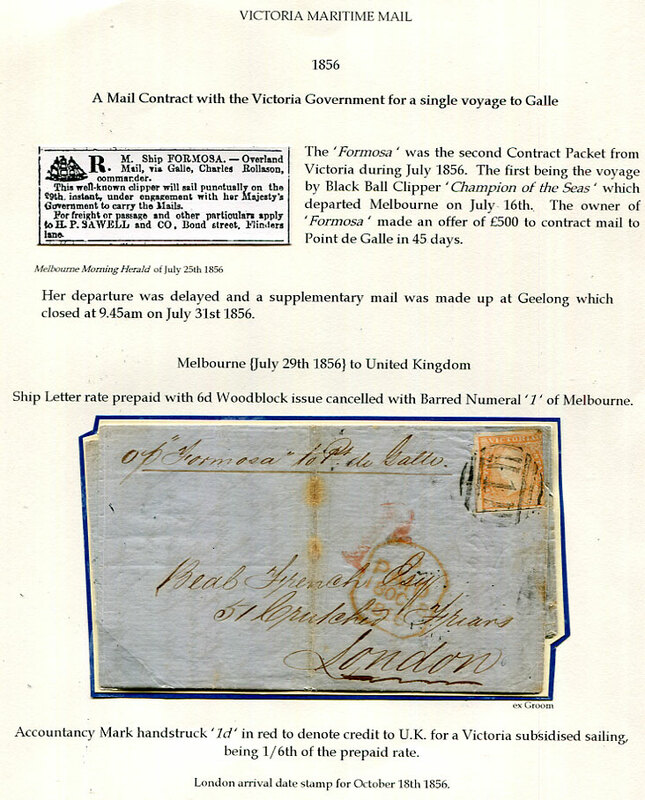 In January 1840 she intercepted and detained the Portuguese slave vessel 'Louisa' which had 283 slaves on board, in February she intercepted, boarded, and inspected the papers of the Spanish vessel 'Iberia' sparking an international incident, & having left Jamaica for Bermuda and Newfoundland, and while in port at Quebec, a Cleopatra seaman, Robert Collins, killed the ship's Sergeant of Marines. 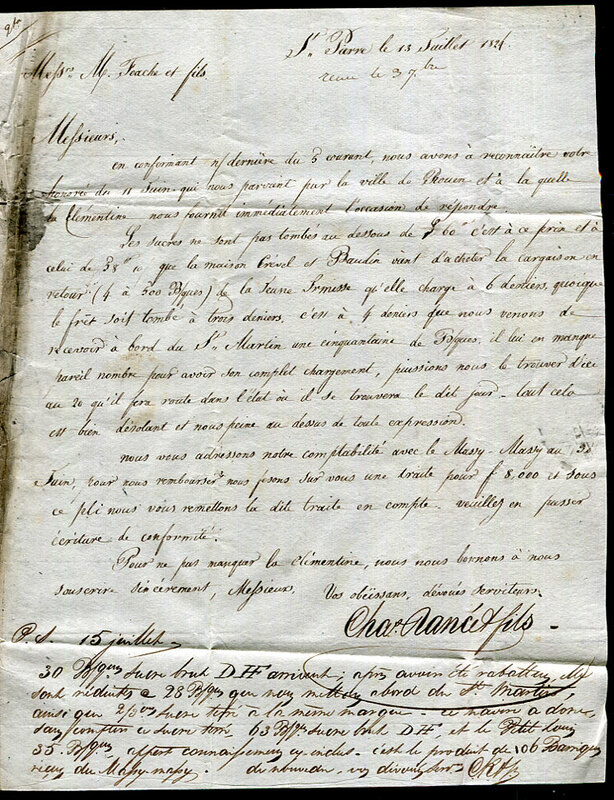 Collins was tried and executed by hanging from the fore yardarm, being the first shipboard execution at Quebec and the third navy execution since 1812. 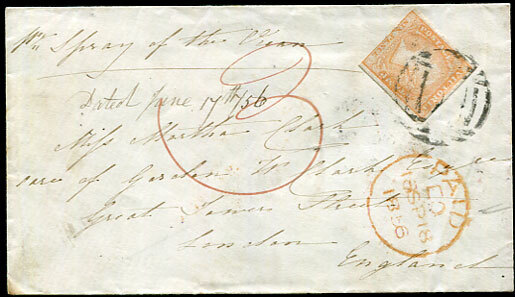 Lushington had fallen very ill in early 1840 and after 9 months of prolonged illness was invalidated in November & replaced by Captain Alexander Milne. 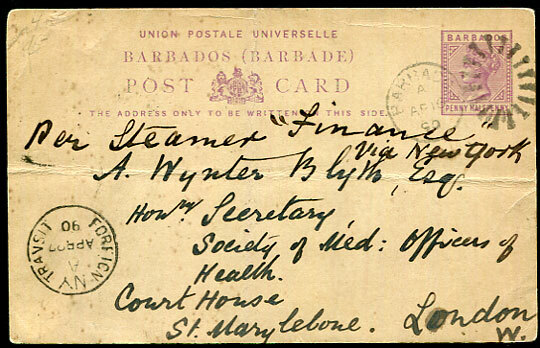 The 1st Cleopatra capsized mid-Atlantic AU 22 1827, crew rescued, voyage Barbados to Windsor, N.S. 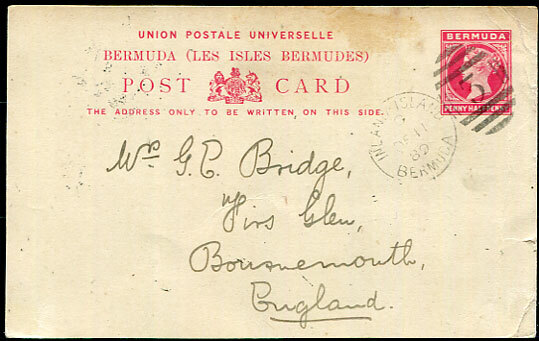 1937 (JY 6) illustrated cover to the Belmont Manor and Golf Club in Bermuda with U.S. 3c pmk'd PRES. 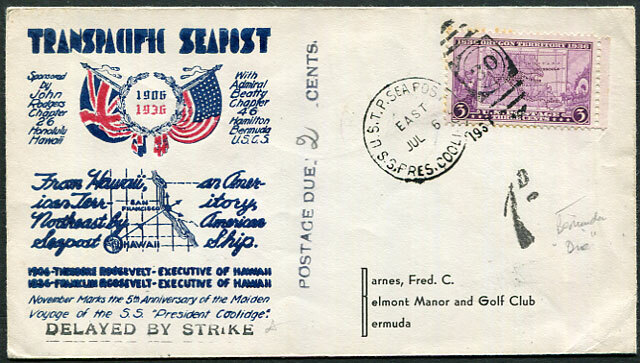 COOLIDGE SEA POST duplex with "DELAYED BY STRIKE" and Postage Due 2 CENTS str. 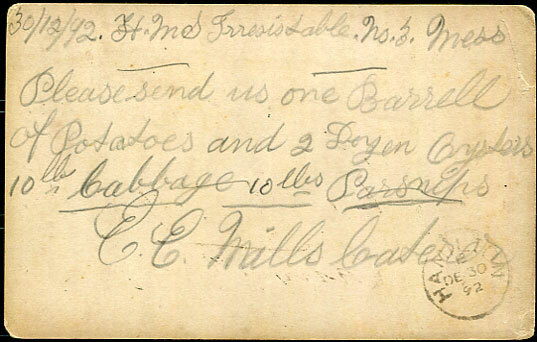 lines with handstruck "1d" due added on arrival. 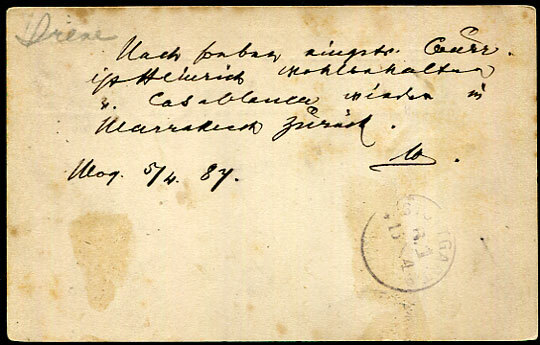 Latest recorded use of 11 months 11 days after introduction of K4/K4a duplex series on 1889 use of QV 1½d Post Card pmk'd C/DE 11 89 to Bournemouth, England, reverse headed "H.M.S. 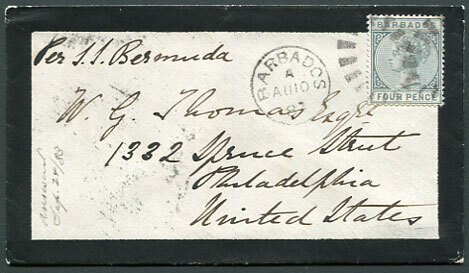 Canada, North America & West Indies Station", some faults. 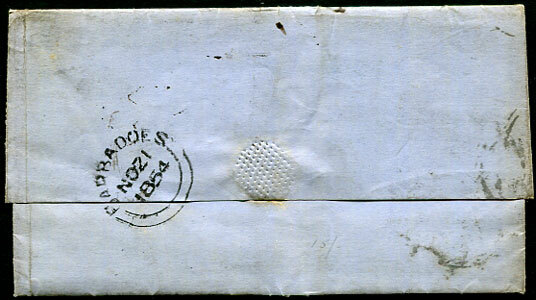 The K4a "3" duplex with corrected IRELAND-ISLAND issued JA 1 1889.